The Umayyad mosque lies in the centre of old Damascus and is one of the largest and oldest mosques in the world. It was built between 706 and 715 on the site of a Christian church dedicated to John the Baptist. The same site had been used as a temple of Jupiter in Roman times. The mosque holds a shrine which is said to contain the head of John the Baptist, honoured as a prophet by Muslims and Christians alike. 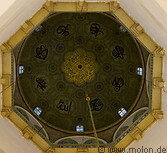 The mosque is beautifully decorated with Islamic art and a large number of mosaics.